The objective of this research is to determine the relationship between service quality and outpatients’ satisfaction towards public hospitals in Malaysia. Five dimensions from SERVQUAL model, Competency, Responsiveness, Courtesy, Tangibility and Reliability are used in the research model. A cross-sectional survey was conducted in hospitals located in States with the highest average outpatient numbers, namely Hospital Kuala Lumpur, Hospital Pulau Pinang and Hospital Putrajaya. The convenience sampling technique was used and 409 useful questionnaires were collected. The results showed that there is a significant positive relationship between Competency, Tangibility, Reliability and Outpatient Satisfaction. However, Responsiveness and Courtesy have a positive and insignificant relationship with Outpatients’ Satisfaction. By determining the significant variables influencing outpatients’ satisfaction, this study gives an insight for managers and staff of public hospitals on the effect of service quality towards outpatients’ satisfaction and also recommends ways for improvement. Local Authorities play an important role in the national development of any country as they are the vehicle for basic municipal service delivery. They are the interface of government and its citizenry at the local level meaning that local authorities represent government in action. As such, the same are expected to proffer sustainable services in the right amount and at the right time. Local authorities therefore provide the backbone for a country’s socio-economic development. However, the recent history of the local authority sector suggests that Councils have fallen way behind in terms of delivering on their mandate due a number of factors. The Ministry responsible for Local Government in Zimbabwe notes that the peak year where councils were optimally functional was 1996 and this is the level that has been benchmarked. In the main, it may be noted, that Councils in Zimbabwe rank among the most liquid organisations; their revenues are guaranteed in the Constitution and in some way in the relevant Acts of Parliament. As such, it is within the rights of the public to expect local authorities to offer more than they have done since the turn of the millennium. It may be argued that the set-up of Local Authorities in Zimbabwe is not aligned to the objective of delivering optimal services to communities with the same not responding to the demands of the people as well the operating environment. To significantly alter this negative spiral of performance, it is imperative that Local Authorities deal decisively with issues surrounding organisational culture in order to focus members (councillors and employees), policies and processes towards the achievement of both local and national goals and priorities. This study reviews several literature already proffered on the subject matter in conjunction with primary research with a view to add to the body of knowledge in the area of study. This study contributes in the existing literature in the field of organizational culture and service delivery in the public sector. Research has been carried out on organizational culture in the private in developed countries. There is limited literature on organizational culture in the public sector, mainly in the developing world. The study used qualitative research methods that present a practical way of establishing the organisational culture aspects such as norms, values and belief systems that can’t be measured quantitatively. It is argued that while increase in budgetary allocation to social services is highly desirable, it is not sufficient to guarantee enhancement in better health outcome. This paper links public health expenditure, economic growth and health outcomes and the causality among them using Nigeria data. The finding suggests increase in public health expenditure has decreased infant mortality rate while infant mortality rate is negatively correlated with economic growth. Interestingly, the direction of causality among public health expenditure, infant mortality rate and growth is unidirectional, from public health expenditure to growth. This is one of the few studies which have investigated public health expenditure, economic growth and health outcomes (infant mortality rate) in Nigeria. This is a qualitative paper which is to present the facts and literature findings on the causes of good governance practice in Ghana conceptually. It is noted that discipline and probity are the backbone of good governance. Every country in this modern era want to achieve good governance so that there will be improvement in the economic fortunes but this cannot be achieved if there is lack of discipline and lack of probity in the practice. Hence, literature reveals that there are some relationships between discipline (independent variable), probity (mediating variable) and good governance (dependent variable). Good governance is the main important factor to eradicating poverty and advancing development, said by the UN former Secretary General – Kofi Annan (Court, 2001). This research is purely a conceptual research and a model/conceptual framework has been proposed for future scientific research. Hypothesis has been proposed which need to be developed and tested for effective and efficient conclusion in future findings as such. This research only proposes the concepts that are associated with good governance practice – discipline and probity; the methods used are the secondary sources of data findings were analyzed. Future research findings, analysis and recommendation is eminent on this proposed concept model for future researchers. Therefore, a strong methodology is needed to support all the findings and interpretations of the hypothesis. In this instance, quantitative and qualitative study as a mixed method would be suitable for future research to test relationships and hypothesis that are been identified in the proposed conceptual model. The aim of this conceptual paper is to contribute to the burning issues of the lack of discipline and probity as a deterrent in the developing world from achieving good governance. This study contributes in the existing literature of the concepts needed in practice to improve good governance for development. This study have examined the determinants of corruption in Nigeria's public sector using ten local government areas in Lagos State and Federal Capital Territory in Abuja during the period 2017-2018. Plethora of studies has analyzed the relationship between corruption and economic growth using different econometric techniques and statistical simulation. This study, however, departed from the common methodological approach by conducting a survey of corruption in public sector to ascertain its determinants. Findings from a survey of one thousand and seventy six (1976) subjects were documented and multiple variables emanated as critical determinants of corruption in public sector. The study recommends that policy makers should intensify efforts at re-orientating the society against the ills of corruption by establishing high ethical standards to which all and sundry must adhere. 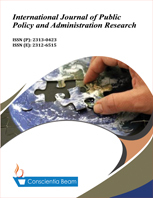 This study contributes to the existing body of literature by adopting a survey technique to ascertain the determinants of corruption in Nigeria's public sector by exploring ten (10) local government areas in Lagos State and Federal Civil Service in Abuja. A large number of studies in this area have employed theoretically established and econometric expositions to validate the determinants of corruption. The study uses common statistical technique to analyze both the causal and determinate variables motivating corruption.